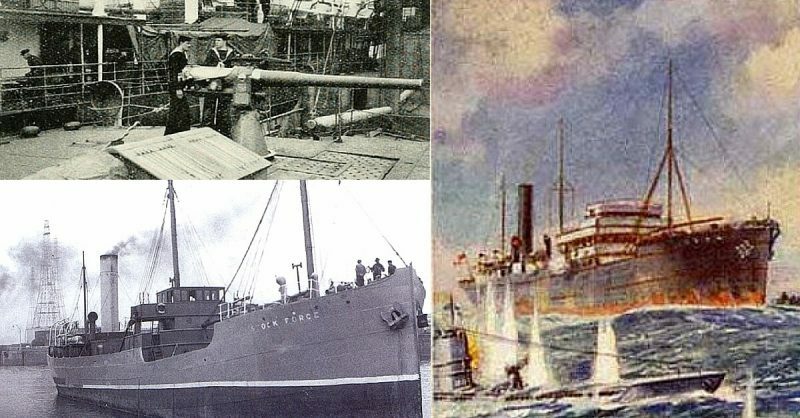 At the end of July 1918 the British Royal Navy vessel HMS Stock Force was under the command of Lieutenant Harold Auten of the Royal Navy Reserve. 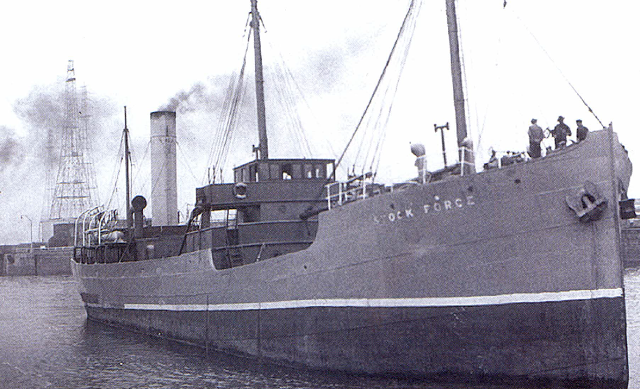 HMS Stock Force was a ‘Q-Ship’, a heavily armed ship designed to look like a weak merchant vessel. 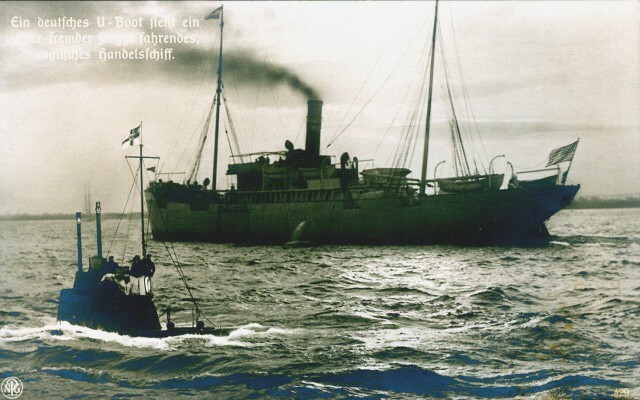 The Royal Navy use of Q-Ships was begun in response to pressure put on Allied shipping by the German U-boats. The submarine U-boats were very effective, and were near impossible to engage unless they surfaced, so the job of Q-boats was to draw the enemy into an engagement by a false display of weakness, whereupon their hidden armaments could be unleashed. HMS Stock Force succeeded in her purpose on July 30th, 1918, some four months before armistice was declared and the war ended. At 5pm, she was torpedoed by a German U-boat in the English Channel, 25 nautical miles from the coast of Devon. The torpedo hit the forward section of the innocuous looking steamer, and the explosion sent a great quantity of debris high into the air. A number of officers and men were injured, and the forward gun battery was put out of action. The damaged bow began to settle into the water. Below decks, the ship’s doctor, Surgeon Probationer G.E. Strahan, worked waist deep in salt water as the wounded were hurried to him. Part of the Q-ship’s decoy tactic was to deploy what was known as a “panic party”. This was a group of men whose job it was to make a show of abandoning ship, thereby drawing the enemy U-boat into surfacing to finish the job. HMS Stock Force‘s “panic party” was duly deployed, under the command of a Lieutenant Workman, who had already sustained an injury in the initial strike. In small boats, he and his men commenced to row away from their damaged ship. Half a mile away the threatening shape of the German submarine rose to the surface. The captain, Lieutenant Harold Auten, remained at his post. The crews of the HMS Stock Force‘s two undamaged guns stayed hidden. For about a quarter of an hour, all was quiet. In the shattered bow, one member of the gun crew lay trapped under the wreck of the foremost gun. The water was rising around him, but he and the rest of the crew knew that any attempted rescue would risk shattering the illusion which they had so far successfully maintained. He lay quietly, bravely accepting his fate. The crew of the submarine were wary of a trap, but as they watched the foundering Q-ship they could see nothing to suggest that she was anything other than what she seemed – a fat supply vessel, and easy prey for the shells of a powerful U-boat. When the small boats which had fled the ship were seen to change course and row back toward HMS Stock Force, the submarine captain gave the order to close in. Slowly he brought his vessel toward his seemingly helpless enemy, until they were only three hundred yards apart. Still Lieutenant Auten did not give the order to fire. The submarine drew along the port side of the stricken vessel, but only when it was perfectly aligned into the range of both of HMS Stock Force‘s surviving guns did Lieutenant Harold Auten finally break his cover and give the order to open fire. It was a full forty minutes since the initial torpedo strike. Lieutenant Auten was 27 years of age in July of 1918. Usually, he was known as a pleasant fellow with a welcoming manner and an easy smile, but he was not smiling now. His mouth was set, and his eyes were hard as he watched the efficient destruction which his hidden guns now wreaked upon the German submarine. HMS Stock Force fired once, twice, three times. The hunter became the hunted, the predator became prey. The first shot from HMS Stock Force destroyed one of the U-boat’s periscopes, and the second hit its raised command tower, blowing it apart and sending body of the man inside flying far into the air. The third shot ripped into the hull of the submarine where it emerged from the water. The sea poured in through the gaping hole at the submarine’s waterline. Unable to retaliate, the U-boat’s bow lifted up out of the water as the stern sank back. The gunners on the Stock Force pounded a relentless barrage of shells into the sinking vessel, until at last it disappeared beneath the waves, defeated. It took nearly four hours for HMS Stock Force to succumb to the incredible damage sustained in the initial torpedo attack. Her crew worked flat out to keep her afloat while they awaited rescue, which arrived at last in the form of a trawler and two torpedo boats. As the rescued men looked on, their damaged ship finally went down with her colors flying proudly, victorious. The gunner trapped beneath the wreck of the forward gun had been rescued, near to drowning, and was lauded for his bravery when the engagement was reported on some months later. The captain, Lieutenant Auten, had behaved coolly and sensibly throughout the action, and had achieved victory by combining all the potential of the Q-boat’s subterfuge tactics with his own bravery and that of his crew. The Q-boats were a closely guarded secret during the war, and so when Lieutenant Auten was honored with the Victoria Cross, soon after the action and with the war still ongoing, very little detail was given out about the reasons for the award. His reputation grew after the war, though. He wrote a book about the Q-boats and even starred in a silent film about the Stock Force, in which he played himself. He returned to the Royal Navy to serve in World War II where he again gave distinguished service. He survived the conflict, and went on to live in peace in the United States, where he died in 1964 at the very respectable age of 73.